Context: Acquired immunodeficiency syndrome (AIDS) is an acronym for AIDS caused by a retrovirus known as human immunodeficiency virus (HIV) which breaks down the body's immune system leaving a patient vulnerable to a host of life-threatening opportunistic infections, neurological disorders or unusual malignancies. According to estimates by the World Health Organization and UNAIDS, 35 million people were living with HIV globally at the end of 2013. The first AIDS case in India was detected in 1986. Seldom studies have been conducted correlating these parameters with oral manifestations in the Indian population. Aim: The present study was carried out to evaluate the CD4 cell counts and oral manifestations in HIV-infected and AIDS patients and to correlate them with the seronegative controls. Methodology: This was a cross-sectional, hospital-based study on individuals who were divided into three groups, Group A consisting of 500 patients who were healthy controls without any systemic illness; Group B consisting of 500 patients who were diagnosed as HIV infected and Group C consisting of 500 patients diagnosed as AIDS patients depending on their CD4 cell counts. The permission from the Ethical Committee of the Institution as well as Superintendent of Government Hospital was obtained. Evaluation of CD4 cell counts in HIV-infected and AIDS patients was done using CyFlow Counter. Results: The results were found to be statistically significant with the P < 0.001 for the CD4 cell counts. Oral manifestations revealed varied results with different levels of significance. Conclusion: CD4 cell counts were significantly altered in HIV-infected and AIDS patients when compared with the controls while oral manifestations revealed varied results with different levels of significance. Acquired immunodeficiency syndrome (AIDS) is an acronym for AIDS caused by a retrovirus known as human immunodeficiency virus (HIV) which breaks down the body's immune system leaving a patient vulnerable to a host of life-threatening opportunistic infections, neurological disorders or unusual malignancies. The two known types of this virus include the HIV-1 and HIV-2 which belong to a family of primate lentiviruses. HIV is a spherical virus enveloped by a lipid bilayer about 90–120 nm in size. The nucleocapsid has an outer icosahedral shell and an inner cone-shaped core enclosing the ribonucleoproteins. The virus core contains the major capsid protein p24, nucleocapsid protein p7/p9, two copies of genomic RNA and the three viral enzymes (protease, reverse transcriptase and integrase). The viral core is surrounded by a matrix protein called p17 which lies underneath the virion envelope. Studding the viral envelope are two viral glycoproteins, gp120 and gp41., According to estimates by World Health Organization (WHO) and UNAIDS, 35 million people were living with HIV globally at the end of 2013. Based on HIV Sentinel Surveillance (2008–2009), it is estimated that 23.9 lac people are infected with HIV in India, of whom 39% are females and 4.4% are children. The first AIDS case in India was detected in 1986. HIV is transmitted by both homosexual and heterosexual contact, by blood and blood products, by infected mothers to infants either via intrapartum or perinatal routes or via breast milk and by occupational transmission. There is no evidence till date that HIV transmission can occur as a result of exposure to saliva, tears, sweat and urine. HIV can infect many tissues; however, there are two major targets of HIV infection: the immune system and the central nervous system. Profound immunosuppression, primarily affecting the cell-mediated immunity, is the hallmark of AIDS. HIV enters the body through mucosal tissues and blood and first infects the T-cells as well as dendritic cells and macrophages. The infection becomes established in lymphoid tissue where the virus may remain latent for long periods. Active viral replication is associated with more infection of cells and progression to AIDS. In addition to the lymphoid tissue, the nervous system is a major target of HIV infection. Macrophages and microglial cells in the central nervous system that belong to the monocyte and macrophage lineage are the predominant cell types in the brain that are infected with HIV. The incidence and severity of several common cutaneous diseases are increased in patients with HIV, and this correlates in many instances with the absolute number of CD4 T-helper cell counts. The cutaneous manifestations can occur in all stages of HIV disease, and it is a prognostic indicator for the development of AIDS. India carries the third largest number of HIV-infected patients in the world after South Africa and Nigeria. In India, the highest prevalence of HIV/AIDS cases has been observed in Nagaland followed by Mizoram, Manipur and Andhra Pradesh (0.59%) according to the latest National AIDS Statistics (NACO, HIV Sentinel Surveillance 2012–2013). HIV infection causes depletion of CD4 cells in the peripheral blood and lymphoid tissues, causing CD8 cell dysfunction. Quantification of CD4 helper lymphocytes is, thus, essential in the staging and monitoring of patients infected with HIV. Since the onset of HIV/AIDS epidemic, the oral cavity has played a key role in helping to define the natural history of HIV/AIDS. Oral manifestations of HIV occur in approximately 30%–80% of all the affected patients, and the factors which predispose to the expression of these lesions include the CD4 cell counts (<200 per mm 3), viral load, xerostomia, poor oral hygiene and smoking (EEC, 1993). 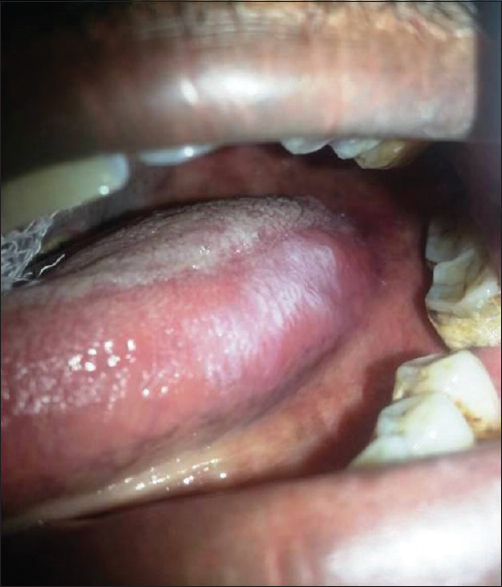 Although the most common oral lesion is the opportunistic fungal infection (candidiasis), normal microbial flora or commensals of the oral mucosa which are present in the saliva, dental plaque, gingival crevice, tonsils and pharynx may become invasive or virulent as a result of the weakened immune defenses. With reduced CD4 cell counts in HIV infection, granulocytopenia occurs. When the counts of granulocytes fall < 500 per mm 3, in the presence of an attendant anatomical barrier damage that follows the viral infection, invasion of the bloodstream by microorganisms is facilitated with resultant sepsis and death. The periodontal tissues in the mouth provide a potentially weak barrier through which bacteria and their toxins can enter the connective tissues and systemic circulation. Since the first reports of HIV infection in 1981, the significance and frequency of the associated oral manifestations have been recognized in the sense, some of these lesions may be of predictive value warning of the progression from HIV seropositivity to clinically manifest AIDS. HIV-associated (specific form) periodontal diseases have been reported in HIV-infected persons including linear gingival erythema, necrotizing ulcerative gingivitis and necrotizing ulcerative periodontitis (NUP), which are shown to occur more intensely in seropositive patients. The CD4+T-lymphocytes are the primary target of HIV infection because of the affinity of the virus to the CD4+cell surface marker. Infection with HIV leads to a progressive impairment of cellular functions characterized by a gradual decline of CD4+T-lymphocyte levels in the peripheral bloodstream, which results in an increasing susceptibility to a wide variety of opportunistic, viral, bacterial, protozoal and fungal infections and also to certain malignancies. In India, few studies were reported from Uttar Pradesh, Chandigarh, Karnataka, Tamil Nadu and Manipur. Seldom studies have been conducted correlating CD4 cell counts with oral manifestations in the Indian population. The present study was carried out to evaluate the CD4 cell counts and oral manifestations in HIV-infected and AIDS patients and to correlate them with the seronegative controls. The objectives of the present study included to determine the CD4 cell counts in HIV-infected and AIDS patients; to determine the oral manifestations in HIV-infected and AIDS patients; to correlate the values of CD4 cell counts with the healthy controls and to correlate the values of the same with the recorded oral manifestations in HIV-infected and AIDS patients. 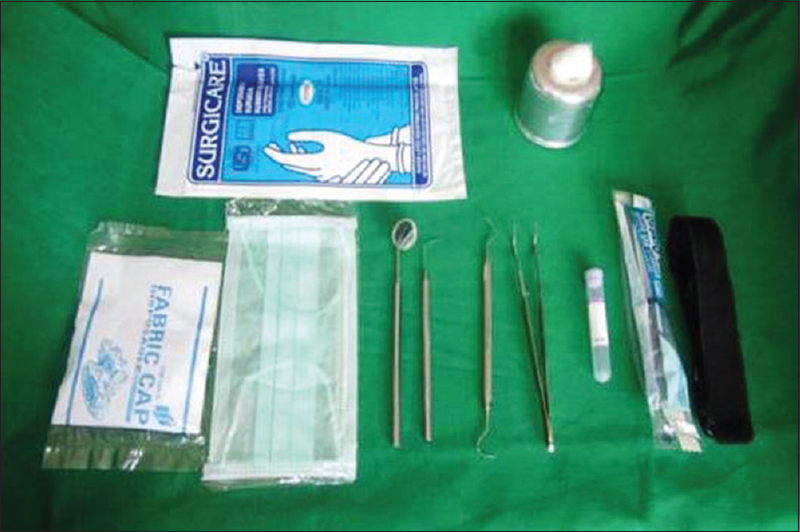 A cross-sectional, hospital-based study was conducted between January 2014 to September 2014 in the Outpatient Department of Meghna Institute of Dental Sciences, Nizamabad and the ART Centre of Government Hospital, Nizamabad to assess CD4 cell counts and oral manifestations in the HIV infected and AIDS patients and to compare the parameters with the healthy controls. The study population included all the patients reporting to the outpatient department of Meghna Institute of Dental Sciences, Nizamabad, and the ART Centre of Government Hospital, Nizamabad, who were interested to participate in the study. Group C: consisting of 500 patients diagnosed as AIDS patients depending on their CD4 cell counts. The permission from the Ethical Committee of the Institution as well as Superintendent of Government Hospital, Nizamabad was obtained before the start of the study. Furthermore, informed consent was obtained from the patients forming the study sample to participate in the study to analyze their CD4 cell counts and oral manifestations. The patients at the extremes of ages, pregnant women and those on chemotherapy were excluded from the study because of possible weakened immune status. The patients who did not agree to give consent and were not willing to participate in the study were also excluded. All the individuals of the Group A and Group B were explained about the study, and written, signed informed consent was obtained from each patient. The patients were made to sit in the chair comfortably, and a detailed history was taken followed by the clinical examination which was performed following the protocols of the Universal Precautions on each individual in the ART Centre with the help of diagnostic instruments and artificial illumination. All the patients in Group C were similarly explained about the study and the same procedure was followed. The findings were recorded in a specialized pro forma with regard to the study using internationally accepted pro forma given by the WHO Collaborating Center on Oral Manifestations of the Immunodeficiency Virus. 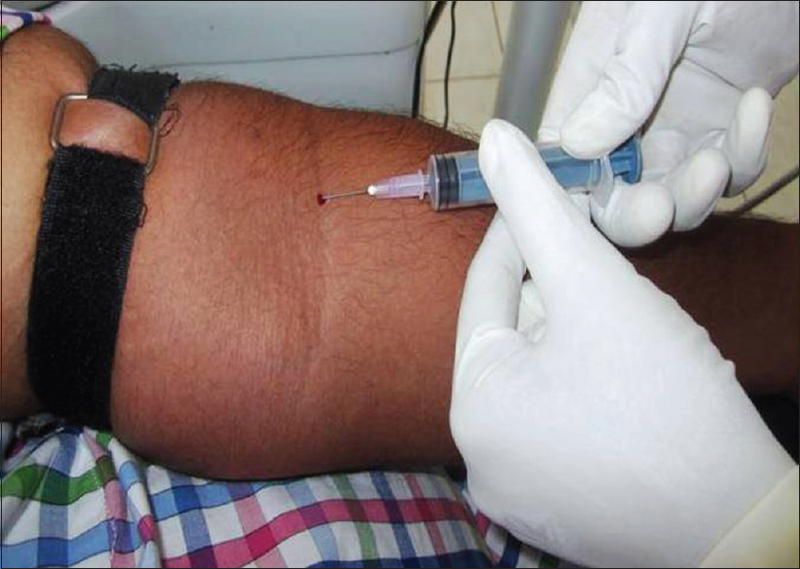 All the patients were, then, subjected to phlebotomy procedure [Figure 2]. The patient was explained about the procedure. The patient's forearm was rested on the laboratory table comfortably. The antecubital fossa was exposed and the tourniquet was applied about ½–2 inch above the antecubital fossa. The area was rendered aseptic with 70% ethyl alcohol, and using a sterile disposable syringe and a 23-gauge needle, a needle puncture was made and maneuvered to enter the antecubital vein and 2 ml of blood was drawn. The tourniquet was, then, relieved and the needle was removed. Dry cotton was placed on the site of needle puncture on the forearm and instructions were given to apply finger pressure for about 5 min and dispose the cotton. The blood was transferred immediately into the tubes containing ethylenediaminetetraacetic acid (EDTA). 50μl of EDTA anti-coagulated blood was added to 10μl of monoclonal antibody and after 15 minutes of incubation, 1ml of No Lyse dilution buffer was added and the sample tube was attached to the Cyflow counter [Figure 3] for an automated evaluation of CD4 cell counts in the collected samples. Comparison of parameters was done using ANOVA with post hoc Games-Howell test. A P< 0.05 was considered statistically significant. 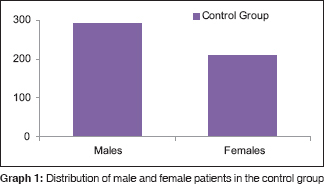 The distribution of patients based on age and gender and the distribution of male and female patients based on age are shown in [Table 1], [Table 2], [Table 3] and [Graph 1],[Graph 2],[Graph 3]. The mean CD4 cell counts in the controls was 1125.38 with a standard deviation of 154.73, in the HIV group was 501.35 with a standard deviation of 140.20 and in the AIDS group was 256.41 with a standard deviation of 67.05. The results were found to be statistically significant with the P < 0.001 [Table 4] and [Graph 4]. 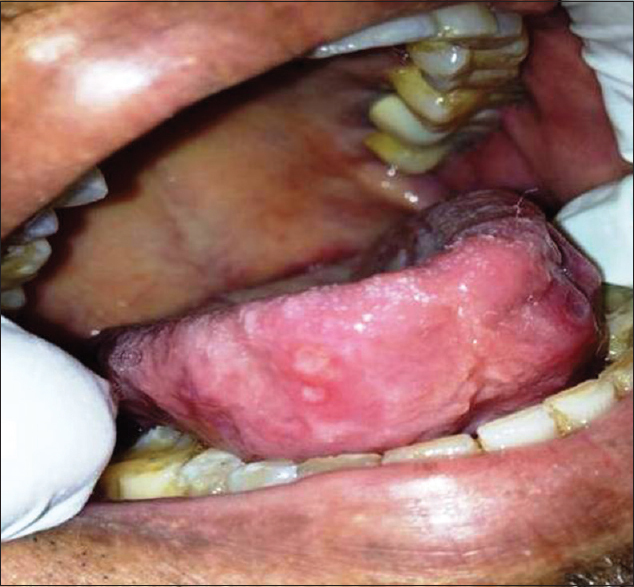 Angular stomatitis [Figure 4] was seen in 0.8% of the controls, 1.6% in the HIV group and 3.8% in the AIDS group, while aphthous ulcer [Figure 5] was seen in 1.0% in the controls, 5.6% in the HIV group and 4.4% in the AIDS group. Dry mouth was seen in 0.2% of the controls, 2.8% in the HIV group and 5.8% in the AIDS group. Herpes zoster infection [Figure 6] was observed in 0.6% in the AIDS group, while herpetic labialis [Figure 7] was observed in 0.6% in the controls, 2.2% of the HIV group and 3.4% of the AIDS group. 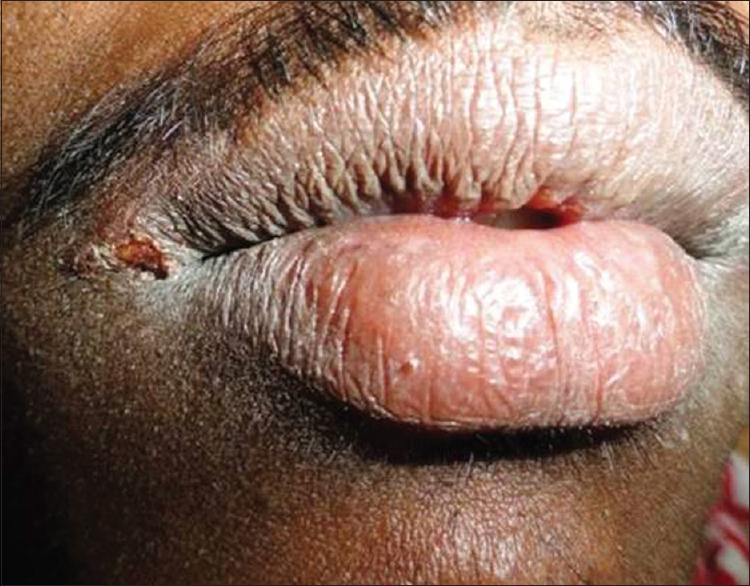 Oral candidiasis [Figure 8] – acute pseudomembranous candidiasis and [Figure 9] – erythematous candidiasis] was seen in 4.2% in the HIV group, while 11.6% of the patients were seen afflicted with the same in the AIDS group. Oral hairy leukoplakia [Figure 10] was seen in 1.2% in the HIV group and 3% in the AIDS group. Other oral findings including frictional keratosis, oral submucous fibrosis (OSF), oral lichen planus (OLP), oral leukoplakia and traumatic ulcers were cumulatively seen in 1.6% of the controls, 8.2% in the HIV group and 3.8% in the AIDS group [Table 5]. HIV infection/AIDS is the most deadly disease which causes devastation to the body by affecting the host's immune system. The pathogenesis of HIV infection is largely attributed to the decrease in the number of T-cells (a specific type of lymphocytes) that bear the CD4 cell surface receptors (CD4+). The immune status of a child and/or adult with HIV can be assessed by measuring the absolute number (per mm 3) or percentage of CD4+ cells and this is considered as the standard way to assess and characterize the severity of HIV-related immunodeficiency. Progressive depletion of CD4+ T-cells is associated with progression of HIV disease and an increased likelihood of opportunistic infections and other clinical events associated with HIV including wasting and death. The normal absolute CD4 cell counts in adolescents and adults range from 500 to 1500 cells per mm 3 of the blood. In general, the CD4 (percentage of CD4+ cells or absolute count) progressively decreases as the disease advances. In children, individual counts may vary within an individual and assessing the CD4 counts over time is more useful. The CD4 cell counts usually increase in response to an effective combination ART although this might take many months. The proposed immunological classification outlines four bands of HIV-related immunodeficiency as none, mild, advanced to severe immunodeficiency. The likelihood of disease progression to AIDS or death without ART increases with increasing immunodeficiency (decreasing CD4 cell counts), opportunistic infections and other HIV-related conditions increasingly likely with falling CD4 cell counts, especially below 200 cells/mm 3 of the blood. Response to ART is affected by the immune stage at which it is started with individuals commencing ART with advanced immunodeficiency (CD4 cell counts > 200–350 per mm 3) to have better virological outcomes than those who commence with more severe immunodeficiency. Adults starting ART with CD4 cell counts < 50 per mm 3 have a much greater risk of death. On the contrary, adults who commence ART with mild immunodeficiency do not appear to obtain any additional benefits. Pregnancy does affect the CD4 cell counts although the significance of these changes is not clearly understood, and for practical purposes, the immunological classification remains the same. The present study was carried out to evaluate the CD4 cell counts and oral manifestations in HIV-infected and AIDS patients and to correlate them with the seronegative controls. 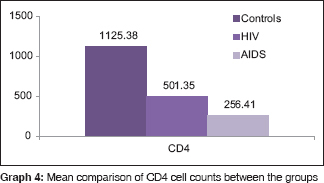 CD4 cell counts are essential for the assessment of immune status in HIV-infected individuals as the pathogenesis of AIDS is largely attributed to a decrease in absolute CD4 cell counts. Different methods have been implemented in evaluating the CD4 cell counts by different authors. Chanarat et al. used Coulter Manual CD4 Kit for evaluating the CD4 cell counts. Ghate et al. estimated the CD4 cell counts using a formula where total leukocyte count was multiplied by lymphocyte percentage and divided by 100 and then multiplied by 100th part of CD4 percentage. Pasupathi et al. and Srirangaraj and Venkatesha  estimated the CD4 cell counts using Fluorescence Activated Cell Sorter (FACS) Count System. Gaurav et al. estimated the CD4 cell counts using Flow Cytometry (SRL, Ranbaxy). Angelo et al. estimated the CD4 cell counts using Automated Flow Cytometer Software (multi-set). Tiwari et al. estimated the CD4 cell counts using Flow Cytometry Absolute Cell Count System at NPHL. Mbanya et al. estimated the CD4 cell counts using conventional flow cytometry using a Becton Dickinson FACS count. Sen et al. estimated the CD4 cell counts using FACS Counter. Edathodu et al. estimated CD4 cell counts by standard flow cytometry using FACS Calibur. Parinitha and Kulkarni  estimated CD4 cell counts in BD FACS Calibur Flow Cytometer, an automated multi-color system. 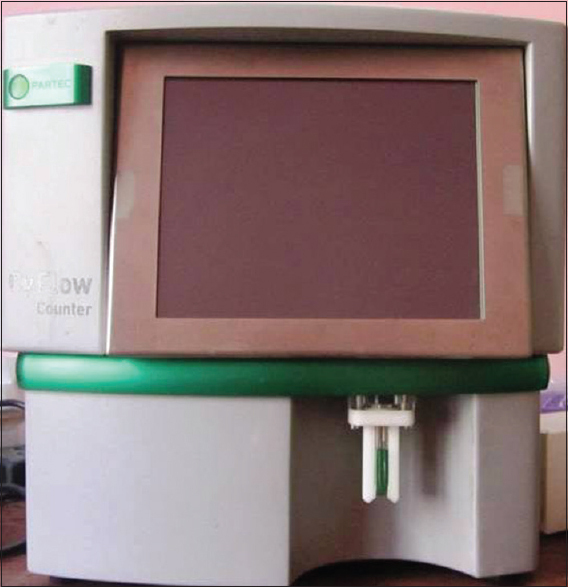 In the present study, Partec Cyflow Counter was used to estimate the CD4 cell counts as it was relatively small, reputed to be easy to use and had a high throughput of samples. In the present study, the mean CD4 cell counts in the controls was 1125.38 with a standard deviation of 154.73, in the HIV group was 501.35 with a standard deviation of 140.20 and in the AIDS group was 256.41 with a standard deviation of 67.05. The results were found to be statistically significant with the P < 0.001. A gradual decrease in the CD4 cell counts observed in HIV-infected and AIDS patients in the present study when compared to the controls were still higher than the mean values observed in the two studies conducted by Pasupathi et al.,, who recorded a mean CD4 cell count of 394 in HIV-infected and 191 in AIDS patients and 375 in HIV-infected and 150 in AIDS patients, although the results obtained were found in accordance with the results obtained in the studies conducted by Tiwari et al., who recorded a mean value of 281 cells per mm 3, and Sharma et al., who observed a mean CD4 cell count of 622.4 in HIV-infected and 245.39 in AIDS patients as against 798.81 in the control group. The values obtained in the present study were found to be slightly higher than the values obtained in the study conducted by Gaurav et al., who divided the patients based on their CD4 cell counts into three groups with Group I (10–300), Group II (301–600) and Group III (>600) and obtained a mean of 163.43 in Group I, 325 in Group II and 502.33 in Group III. The reason for the higher values obtained in the present study as compared to most of the studies might be due to the difference in the classification of the patients into HIV-infected and AIDS patients based on the CD4 cell counts. In the present study, HIV-infected and AIDS patients were categorized based on their CD4 cell counts with 10–350 and 350–500 cells per mm 3 of the blood. The CD4 lymphocytes are the primary target of HIV infection because of the affinity of the virus to the CD4 cell surface receptors (CD4+). Infection with HIV leads to a progressive impairment of cellular functions characterized by a gradual decline in peripheral blood CD4+ lymphocyte levels, which results in increasing susceptibility to a wide variety of opportunistic viral, bacterial, protozoal and fungal infections and certain malignancies. Tiwari et al. reported that the CD4 cell counts decreased due to the disruption of the cell membranes of the said cells as HIV buds from the surface or the intracellular accumulation of heterodisperse RNAs and unintegrated DNAs takes place with the progression of the disease process. Furthermore, it has, also, been proposed that an intracellular complexing of CD4 cells with the viral envelope products results in cell killing. Similarly, Tiwari et al. proposed untimely induction of a programmed cell death (apoptosis) as an additional mechanism for CD4 cell loss in HIV infection. HIV-related oral abnormalities have been reported in 30%–80% of the HIV-infected patients. 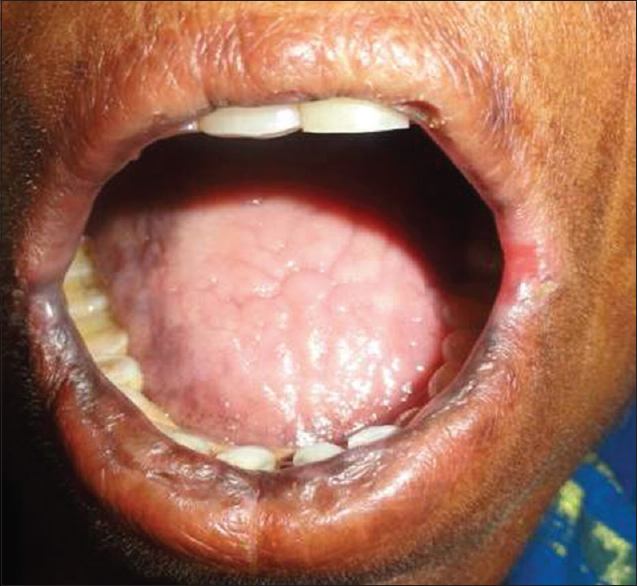 Oral lesions play an important role in the early diagnosis and management of the HIV-infected and AIDS patients. Oral lesions have been shown to be associated with increased risk of progression of HIV disease and highly predictive markers for severe immune deterioration., In the present study, a high prevalence of oral candidiasis was observed followed by dry mouth, aphthous ulceration, angular stomatitis, herpetic labialis, oral hairy leukoplakia, herpes zoster apart from other oral findings including frictional keratosis, OSF, OLP, oral leukoplakia and traumatic ulcers, which were cumulatively seen in 1.6% of the controls to 8.2% in the HIV group and 3.8% in the AIDS group. Oral candidiasis was most common and was seen in 4.2% in HIV-infected patients while 11.6% in AIDS patients which was in accordance with the findings of the studies conducted by Abhinandan et al., who observed oral candidiasis in 14% of the HIV-infected patients, and Rao et al., who noted oral candidiasis in 16.4% of the HIV-infected patients. The percentage of cases in relation to oral candidiasis was, however, less than that observed in the study conducted by Shobhana et al. The lower incidence of oral candidiasis in the present study might be explained by the fact that relative number of patients with CD4 cell counts < 200 per mm 3 might be less than that compared with the other studies. The possibility for the strong association between oral candidiasis and HIV positivity, especially, in those who are about to develop full-blown AIDS is that the salivary IgAs affect the adherence of Candida to buccal epithelial cells and the levels of Candida-specific IgAs are elevated in the saliva of healthy patients with oral candidiasis. In HIV-infected patients who develop oral candidiasis, the levels of salivary anti-Candida IgGs are increased while serum and salivary IgAs decrease despite an increased antigenic load. Kolokotronis et al. observed in their study that oral candidiasis and oral hairy leukoplakia in correlation with immunologic status as indicated by low circulating CD4 cell counts and absence of anti-p24 antibodies in the serum and the loss of secretory anti-p24 antibodies in patients with oral hairy leukoplakia might constitute prognostic markers for the progression of HIV infection to full-blown AIDS. Agbelusi and Wright  carried out a study to know the prevalence of oral manifestations in HIV-infected and AIDS patients and found that 43% patients had oral candidiasis which was much higher than as reported in the present study. The majority of oral candidiasis patients had CD4 cell counts < 200 per mm 3 in the present study. Similar results were found in the study conducted by Ranganathan et al. Kerdpon et al. observed a strong association between oral candidiasis and CD4 cell counts of < 200 per mm 3. More number of manifestations was seen in patients with reduction in CD4 cell counts which might be explained on the basis of the severity of immunosuppression seen in this set of patients. The lower incidence of oral candidiasis observed in the present study might be explained by the fact that relative number of patients with CD4 cell counts < 250 per mm 3 was less than that seen in other studies. Dry mouth was observed in 5.8% of the AIDS while 2.8% of the HIV-infected patients. The relative percentages were found to be lesser when compared to the study conducted by Sow et al., who observed 14.3% prevalence of dry mouth in the HIV-infected and AIDs patients. The possible reason attributed to the dry mouth in HIV-infected and AIDS patients might be attributed to the decreased immune levels and/or as an adverse effect of the ART drugs being used to treat the infectious process. Oral hairy leukoplakia was seen in 3% of AIDS patients and 1.2% of HIV-infected patients in the present study in accordance with the results of the study conducted by Agbelusi and Wright, who found a 3% prevalence of oral hairy leukoplakia in their study. 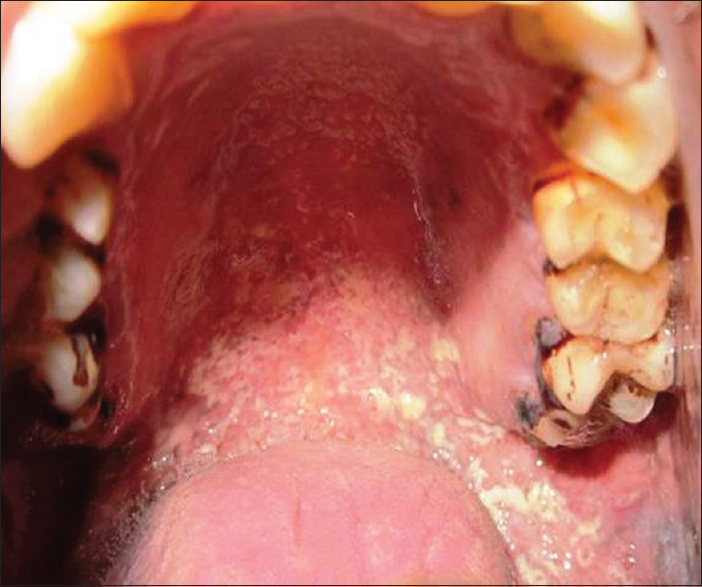 The prevalence of oral hairy leukoplakia was however higher than that found in the study conducted by Rao et al., who observed 0.9% prevalence, and lower than that observed in the studies conducted by Gaurav et al. (17.5%), Lourenço and Figueiredo  (11.8%) and Pedreira et al. (9%). 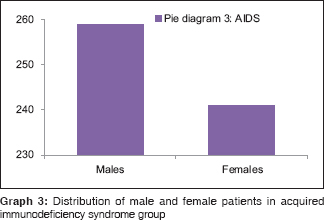 Herpetic labialis was observed in 3.4% of the AIDS patients while 2.2% of the HIV-infected patients in the present study which was higher than the results found in the study conducted by Abhinandan et al. in which they had reported 2% prevalence of the same in the HIV-infected and AIDS patients. In the present study, aphthous ulcerations were observed in 4.4% patients in the AIDS group while 5.6% of the HIV-infected patients presented with such ulcerations. The observation in the present study was slightly higher than that seen in the study conducted by Glick et al. [ 27] which was 3% and higher than the findings of the study conducted by Rao et al., who observed a 3.2% prevalence. Other significant oral findings including frictional keratosis, OSF, OLP, oral leukoplakia and traumatic ulcers were cumulatively seen in 8.2% in the HIV group and 3.8% in the AIDS group higher than the findings of the study conducted by Rao et al. No oral warts were observed in the present study similar to the findings of the other studies conducted in Asia. The possible reason for this might be a functionally incomplete reconstitution that might lead to development of human papilloma virus-(HPV-) related lesions such as warts, condylomas and focal epithelial hyperplasias. The probable enhanced antiviral effect of ART drugs on HPV-related lesions to genetics as well as the virulence factors could be the reasons for the absence of warts in the Asian countries. No case of Kaposi's sarcoma was noted in the present study which was in accordance with the results of the other studies conducted in the past and with the known fact that neoplasms are relatively uncommon in Asians. Thus, the present study reinforces the fact that skin is the most common organ affected in the HIV-infected patients and even, mucocutaneous manifestations are one of the most important clinical prognostic markers and might even indicate to a diagnosis of HIV infection. Furthermore, NUP was, also, not reported in any of the cases in the present study. NUP is significantly more common among homosexuals, irrespective of the racial background, than among any other HIV transmission category. Taking the above findings into consideration, one of the reasons for the absence of NUP in the present study might be because of the very low occurrence of homosexuality in the present region. The potential points of the present study include that equal number of controls, HIV and AIDS cases were included following stringent inclusion and exclusion criteria. Automated analyzers were used which were more exact than the traditional methods followed before. Till date, very few studies included these three different parameters in one study. The statistical analysis of the data was done using appropriate statistical tests which included ANOVA with post hoc Games-Howell test for comparison of the parameters in between the groups. All the required standardized precautions were taken while phlebotomy procedure was performed. The ethical concern was taken before the start of the study. All the appropriate inclusion and exclusion criteria were followed. A systematic methodology was followed throughout the study starting from sample selection to statistical analysis of the results. The duration of the disease was not recorded in the present study while the present study did not take into consideration the pre-ART and ART patients distinguishing between the patients as this was not a longitudinal study where a patient follow-up could be done. CD4 cell counts were significantly altered in HIV-infected and AIDS patients when compared with the controls while oral manifestations revealed varied results with different levels of significance. Further studies are, thus, mandated from across the country with correlation analyses to come to valid conclusions and manage this deadly infectious disease process and use the common oral manifestations observed in the diagnostic as well as the prognostic process in HIV-infected and AIDS patients. We would like to acknowledge all the patients who contributed in the study without whom this study would not have been feasible. Khiangte L, Vidyabati RK, Singh MK, Devi SB, Singh TR, Singh WG. A study of serum lipid profile in human immunodeficiency virus (HIV) infected patients. J Indian Acad Clin Med 2007;8:307-11. Human immunodeficiency virus: AIDS. Ananthanarayan and Paniker's Textbook of Microbiology. 7th ed. New Delhi: Universities Press; 2005. Abbas AK. Diseases of immunity. Robbins and Cotran Pathologic Basis of Disease. 7th ed. Philadelphia: Elsevier Saunders; 2005. HIV sentinels surveillance: 2010-11. National AIDS Control Organization. New Delhi, India; 2012. Fauci AS, Lane HC. Human immunodeficiency disease (HIV): AIDS and related disorders. In: Braunwald E, Fauci AS, Kasper DL, Hauser SL, Longo DL, Jameson JL, editors. Harrison's Principle of Internal Medicine. 15th ed. New York: McGraw-Hill Professional Publishing; 1998. Abhinandan HB, Jain SK, Nyati A, Kumar R, Jain M, Bhuria J, et al. 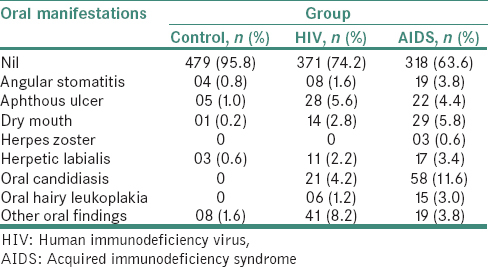 Cutaneous manifestations of HIV-infection in relation with CD4 cell counts in Hadoti Region. J Evol Med Dent Sci 2013;2:7003-14. National Agency for the Control of AIDS. Abuja, Nigeria; 2012. HIV sentinels surveillance: 2012-13. National AIDS Control Organization. New Delhi, India; 2014. Gaurav S, Keerthilatha PM, Archna N. Prevalence of oral manifestations and their association with CD4/CD8 ratio and HIV viral load in South India. Int J Dent 2011;2011:964278. Sow PG, Toure K, Coume M, Dia AT, Diallo PD, Traore J. Oral microbial pathogens isolate in newly diagnosed HIV positive patients: A baseline survey of the Social Institute of Health and Hygiene of Dakar. IOSR J Pharm 2012;2:509-11. Kiran K, Shetty S. Oral and periodontal manifestations among HIV population in Southern India. Int J Basic Applied Med Sci 2013;3:184-9. Adurogbangba MI, Aderinokun GA, Odaibo GN, Olaleye OD, Lawoyin TO. 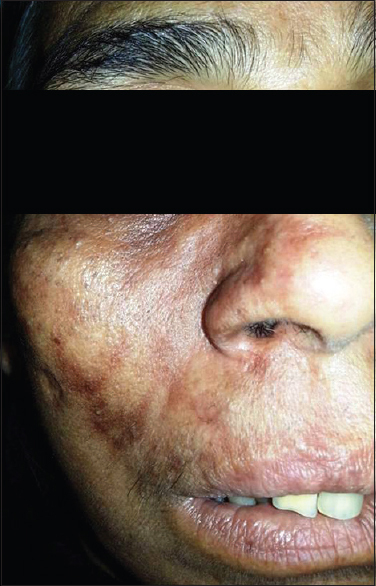 Oro-facial lesions and CD4 counts associated with HIV/AIDS in an adult population in Oyo state, Nigeria. Oral Dis 2004;10:319-26. Parinitha S, Kulkarni M. Haematological changes in HIV infection with correlation to CD4 cell count. Australas Med J 2012;5:157-62. Chanarat N, Chanarat P, Viratsethasin K, Suttajit M, Chiewsilp D. Biochemical and hematological manifestations of HIV/AIDS in Chiang Mai, Thailand. Southeast Asian J Trop Med Public Health 2001;32:500-3. Ghate MV, Mehendale SM, Mahajan BA, Yadav R, Brahme RG, Divekar AD, et al. Relationship between clinical conditions and CD4 counts in HIV-infected persons in Pune, Maharashtra, India. Natl Med J India 2000;13:183-7. Pasupathi P, Manivannan P, Manivannan U, Mathiyalagan D. Thyroid function, cardiac risk assessment profile and hematological changes during HIV infection and AIDS patients. J Med 2010;11:131-6. Srirangaraj S, Venkatesha D. Absolute lymphocyte count as a surrogate marker for CD4 counts after six months of HAART initiation in a resource-limited setting in India. Indian J Med Res 2012;135:895-900. Angelo AL, Angelo CD, Torres AJ, Ramos AM, Lima M, Netto EM, et al. Evaluating total lymphocyte counts as a substitute for CD4 counts in the follow up of AIDS patients. Braz J Infect Dis 2007;11:466-70. Tiwari BR, Ghimire P, Malla S. Study on CD4 cell responses in HIV. Nepal Med Coll J 2008;10:45-7. Mbanya D, Assah F, Ndembi N, Kaptue L. Monitoring antiretroviral therapy in HIV/AIDS patients in resource-limited settings: CD4 counts or total lymphocyte counts? Int J Infect Dis 2007;11:157-60. Sen S, Vyas A, Sanghi S, Shanmuganandan K, Gupta RM, Kapila BK, et al. Correlation of CD4+ T cell count with total lymphocyte count, haemoglobin and erythrocyte sedimentation rate levels in human immunodeficiency virus type-1 disease. Med J Armed Forces India 2011;67:15-20. Edathodu J, Ali B, Alrajhi AA. CD4 validation for the World Health Organization classification and clinical staging of HIV/AIDS in a developing country. Int J Infect Dis 2009;13:243-6. Pasupathi P, Bakthavathsalam G, Saravanan G, Devaraj A. Changes in CD4 cell count, lipid profile and liver enzymes in HIV infection and AIDS patients. J Appl Biomed 2008;6:139-45. Sharma YK, Sawhney MP, Bhakuni DS, Gera V. Oro-cutaneous manifestations as markers of disease progression in HIV infection in Indian setting. Med J Armed Forces India 2004;60:239-43. Reznik DA. Oral manifestations of HIV disease. Top HIV Med 2005;13:143-8. Begg MD, Lamster IB, Panageas KS, Mitchell-Lewis D, Phelan JA, Grbic JT, et al. Aprospective study of oral lesions and their predictive value for progression of HIV disease. Oral Dis 1997;3:176-83. Glick M, Muzyka BC, Lurie D, Salkin LM. Oral manifestations associated with HIV-related disease as markers for immune suppression and AIDS. Oral Surg Oral Med Oral Pathol 1994;77:344-9. 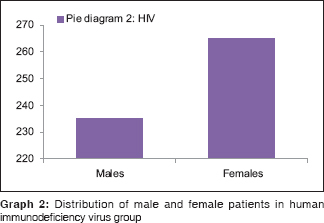 Rao UK, Ranganathan K, Kumarasamy N. Gender differences in oral lesions among persons with HIV disease in Southern India. J Oral Maxillofac Pathol 2012;16:388-94. Shobhana A, Guha SK, Neogi DK. Mucocutaneous manifestations of HIV infection. Indian J Dermatol Venereol Leprol 2004;70:82-6. Molinari JA, Glick M. Infectious diseases. In: Greenberg MS, Glick M, editors. Burket's Oral Medicine, Diagnosis and Treatment. 10th ed. Ontario: B.C. Decker, Hamilton; 2003. p. 539-56. Kolokotronis A, Kioses V, Antoniades D, Mandraveli K, Doutsos I, Papanayotou P, et al. Immunologic status in patients infected with HIV with oral candidiasis and hairy leukoplakia. Oral Surg Oral Med Oral Pathol 1994;78:41-6. Agbelusi GA, Wright AA. Oral lesions as indicators of HIV infection among routine dental patients in Lagos, Nigeria. Oral Dis 2005;11:370-3. Ranganathan K, Reddy BV, Kumarasamy N, Solomon S, Viswanathan R, Johnson NW, et al. Oral lesions and conditions associated with human immunodeficiency virus infection in 300 South Indian patients. Oral Dis 2000;6:152-7. Kerdpon D, Pongsiriwet S, Pangsomboon K, Iamaroon A, Kampoo K, Sretrirutchai S, et al. Oral manifestations of HIV infection in relation to clinical and CD4 immunological status in Northern and Southern Thai patients. Oral Dis 2004;10:138-44. Lourenço AG, Figueiredo LT. 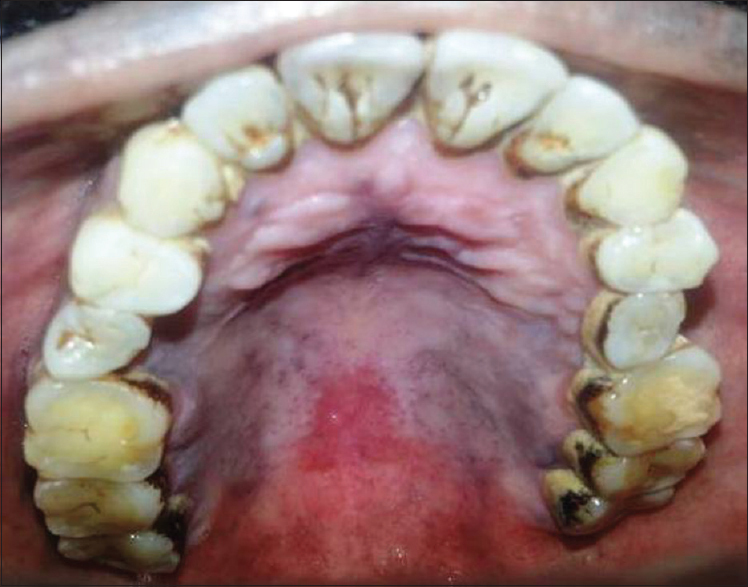 Oral lesions in HIV infected individuals from Ribeirão Preto, Brazil. Med Oral Patol Oral Cir Bucal 2008;13:E281-6. Pedreira EN, Cardoso CL, Barroso Edo C, Santos JA, Fonseca FP, Taveira LA, et al. Epidemiological and oral manifestations of HIV-positive patients in a specialized service in Brazil. J Appl Oral Sci 2008;16:369-75.